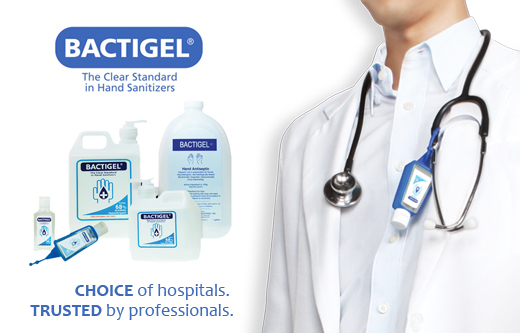 Bactigel is the trusted hand sanitizer in hospitals and industrial areas. It is preferred by professionals due to Bactigel’s efficacy in disinfection. Bactigel contains 68 percent ethyl alcohol, the highest alcohol content for any locally manufactured hand sanitizers. It comes with a specially-formulated fragrance imported from France. It used by most professionals for their sanitizing solution at work and even for their personal care. It is available for everyone to use through the easy-to-carry bottle sizes partnered with the patented rubber holders. If the PROs use it, why shouldn’t you? Follow us on Facebook, Twitter, and Google +.